Background: Indole-3-Acetic Acid (IAA) is a plant hormone with various applications in the field of agriculture, medicine and research. Objective: We herein examined the production of IAA from various cyanobacterial strains. Method: During the present work, 34 cyanobacterial strains were screened to check their ability to excrete IAA. Culture conditions of the strain producing maximum IAA content under normal conditions, were manipulated to check their effect on IAA production. Excreted IAA was characterized by Thin-Layer Chromatography (TLC), Gas Chromatography-Mass Spectroscopy (GC-MS) and Fourier Transform Infrared Spectroscopy (FTIR). Results: IAA was detected in 20 of the total strains screened. Cylindrospermum stagnale showed maximum IAA production (95.6 μg/ml) in comparison to other strains studied. During optimization experiments, highest IAA content was observed when C. stagnale was incubated with 1,500 μg/mL L-tryptophan, 0.5 μg/mL EDTA, 9 μg/mL citric acid and 1 μg/mL NaCl in BG-11 media at the pH 7.5 for 3 days. 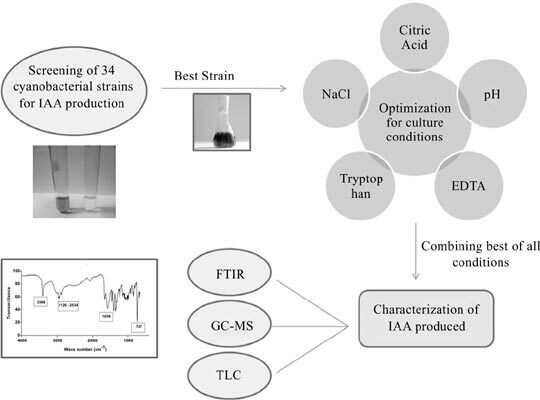 Conclusion: This work intends to 1) search an agriculturally significant cyanobacterial strain which excretes highest amount of IAA among the studied strains; 2) to understand the culture conditions favoring IAA secretion by this strain; and 3) to validate the excreted substance to be IAA through various techniques. Keywords: Cyanobacteria, Indole-3-acetic acid, L-tryptophan, Salkowski reagent, thin-layer chromatography (TLC), fourier transform infrared spectroscopy (FTIR). Keywords:Cyanobacteria, Indole-3-acetic acid, L-tryptophan, Salkowski reagent, thin-layer chromatography (TLC), fourier transform infrared spectroscopy (FTIR). Abstract:Background: Indole-3-Acetic Acid (IAA) is a plant hormone with various applications in the field of agriculture, medicine and research.